I’ve had a couple of very interesting conversations since I posted my preliminary Hugo ballot. Both centered on my inclusion of Richard Powers as a probable nominee for Best Professional Artist. I placed Richard Powers on my preliminary ballot on the strength of the cover art of Eclipse Three. I’ve listened to several interviews with Night Shade Books publisher Jeremy Lassen where he talks about how he got this particular cover for the book. Any mistakes here are mine, but as I understand it, Lassen contacted the estate of Powers and asked if there was any unpublished artwork available to use for a cover. It just so happened that there was this one particular piece of artwork which had been commissioned several decades ago and for whatever reason, was never used or published. At this time nobody knows what the original commission was. Lassen, no fool, snapped up the art and used it for the cover of Eclipse Three. It’s spectacular. One of my first thoughts when I decided to purchase a supporting membership to this year’s Worldcon was that I had to recognize the Powers cover. I absolutely love it. There’s only one thing. Richard Powers died in 1996. I received two e-mails asking me to reconsider my potential nomination of Richard Powers for the Best Professional Artist Hugo. Now, the conversations I had were private correspondence, but Lou Anders was gracious enough to permit me to publicly use some of his words here. The conversations were not simple “Dude, don’t give it to Powers”, but were rather well reasoned explanations stating that while the Powers cover is excellent, the intent of the Best Professional Artist Hugo is to recognize the art of artists working today and who are actively producing new work. The Powers cover would be akin to finding a long lost novel from a deceased master. I do not believe I was following the awards at the time, but was there ever a campaign or a conversation around nominating The Children of Hurin for a Hugo? That would be a similar case to the Powers cover. Or, let’s say that sometime after Harlan Ellison is no longer with us, Last Dangerous Visions is finally published and everyone recognizes that compared to Last Dangerous Visions, the discovery of fire and the inventions of the wheel and sliced bread really weren’t all that impressive. Harlan gets nominated for whichever of the two Best Editor Hugos he is eligible for. We’ll ignore various impossibilities of this happening and just accept it for a moment. Though Last Dangerous Visions may indeed be excellent, such a nomination would not represent the state of the genre today. I think you hit the nail on the head yourself when you said LDV wouldn't represent the state of the genre today and I think that's what an annual award needs to do. Again, Powers was just inducted into the Science Fiction and Fantasy Hall of Fame - which is utterly appropriate and LONG OVERDUE. He's a giant. But he's not TODAY's giant. This is the heart of the issue and the conversations I’ve been having. There is a distinction in the name of the category, “Best Professional Artist”, that suggests the award is not honoring a single work, but rather the body of work over the previous year. Can a single piece of art, no matter how good, honestly outweigh the collected output of a working artist? If, as Lou Anders says, “artists have fought so hard recently for the Best Artist Hugo to be a reflection of current work”, do we do a dishonor to working artists and to the spirit of the award if we nominate and vote for work produced decades ago? This is where I waffle. The Powers cover was first published in 2009. This is not a case of Lassen recycling a cover that was previously on the market. So, from the perspective of a fan who wishes to honor a single piece of art which can be considered one of the best works published in 2009, the work of Richard Powers for the Eclipse cover certainly qualifies and merits a nomination. This is also a particular cover which reflects a 70’s aesthetic while still presenting as modern and something today’s artists would do well to aspire to. On the other hand, the arguments of Lou Anders and the other correspondent are sound and they hold water. While Powers does fit the letter of qualifying for a nomination, there is a serious question of whether Powers fits the spirit and intent of what such a nomination should stand for. Also, the cover of Eclipse Three is only one piece of artwork and the category is intended to honor the body of work published in a given year. Once again, does one piece of art outweigh the collected output of a working artist who produced multiple pieces of high quality art? I don’t know what I’m going to do. I am honestly torn between honoring an excellent piece of art that may have been produced thirty years ago and using my nomination in the spirit in which the Best Professional Artist is intended. It’s something to think about. I very much appreciate the courtesy of the e-mails and the conversations which resulted. They caused me to think through the nomination more fully and they challenged me to become more informed about a somewhat vague category and about the artists working within. "Can a single piece of art, no matter how good, honestly outweigh the collected output of a working artist?" Such is the quality and influence of the greats in a given field that their contemporaries maybe more prolific but an individual work of great quality will not be out done by sheer quantity. The date of publication (or discovery or even conception shall we say) doesn't matter to me. If the Powers' art is phenomenal is it any less so because he passed? Is it his fault that this particular piece wasn't published/used in his lifetime? Should he be punished (excluded from a given award shall we say) because of the previous question? What if his posthumously released work went on to inspire other artist or start a movement within the art community? Are we over the fact that he's dead now? Can we appreciate the work for what it is without regards to when it was released? I'm of the opinion that an artist work should be appreciated when ever it is brought to public light. A Confederacy of Dunces won the Pulitzer something like ten years after the O’Toole committed suicide. However, since I'm a hypocrite... I have a self imposed rule that I don't blog/review about dead authors of the classics as to support those who actively work to keep a given, 'art' alive. So I can kinda see the other side; though I still find it a bit odd that a persons death detracts from the quality of his/her work. I’d say stick to your guns and support what you love. Vote for Powers in 2010! That was a bit more than two cents worth... Apologies. It's not that he is or isn't deceased. It's that the award is called "the 2010 Hugo for Best Profession Artist." So the issue is whether Powers was the Best Artist in the prior year, 2009. Powers is TREMENDOUS and his work did, and does, inspire today's artists (Powers was a direct and stated influence on one of my own anthology covers). I worship Powers and have all my life. But I think his indoctrination into the SF&F Hall of Fame is the appropriate response to his genius today. I don't think he's an accurate reflection of the state of SF&F illustration in 2009. That being said, he is technically eligible and Joe is certainly within his rights to nominate him (and that's cool). I just wanted him to consider the implications of such a nomination, given the struggle inside the SF&F art community this past decade to bring more awareness of current artists and their works as regards this specific award.And Joe is giving the award considerable thought, which is the important thing here, perhaps more so than which way he ends up voting. Thanks! Personally I think the Best Professional Artist Hugo *should* go to a single work of art produced in that year, rather than to the body of work produced in a year. Some artists are far more prolific than others, some get more work than others, and I am wondering if that is potentially where some of the "popularity" argument comes. 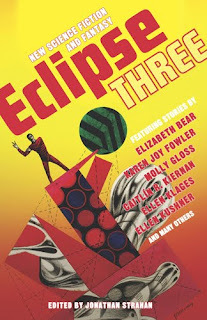 I am a big fan of Richard Powers work and I was particularly thrilled with the story behind the cover for Eclipse Three. It is an amazing triumph and if it brings any attention back to Powers that is great. However, so often 'greats' are noticed after they are dead, when they cannot bask in the glow of recognition from those who appreciate them. We've lost several great artists and authors over the past few years, many of whom were taken out far before their time. I would hate to see Powers get what might be a deserving award in the place of someone who is alive to appreciate it. I appreciate, respect, understand and in many ways agree with your passion, right up to the point of him getting a Hugo for it. Carl: I want to agree with you about the award going to a single piece of art, but I think that misses the intent (and wording) of the category. It would sure as hell make my task easier. Chad: Okay, I see your point on the single piece of art vs the collected output. Perhaps I should amend the question. Does THIS single piece of art, no matter how good, honestly outweigh the collected outputs of today's working artists...artists, who are very much at the top of their games and who are producing some of the best work ever in the genre? I actually wonder of Dunces isn't a symptom of what Carl brought up, recognizing greats only when they are dead. Which is besides the point here. It still goes back to the question of whether nominating Powers meets the intent of the category. I'm thinking not right now. It's a rare thing to have a debate on the internet that doesn't turn into a flame war. I've read what others have said here and accepted some points while wholly rejecting others, but I can respect their opinions. Congrats to you Joe and your readership. I agree completely with Chad, this has been (and hopefully if others join in with continue to be) a very interesting discussion. I suspected that the one specific work idea was not in line with the wording of the category, even though I hadn't read it for myself. Honestly I think what put it in my head was when I was looking at your potential Hugo nomination list the other day and saw that one a couple of examples you mentioned specific book covers. I remember thinking how interesting it would be to see it handled like that, which of course would make for lively debate come awards time, at least for the fans. I am glad to read that Powers was recently elected to the Hall of Fame, which is much deserved. I'm not as deeply involved in the science fiction community as sometimes I wish I had time to be, and so that was something that I was not aware of, which in some ways makes me sad and points back to part of the impetus for this post, because one thing a Hugo would do would put Powers name back in people's minds and perhaps cause more current fans to go back and take a look at his work. Oh, yeah. Umm...I meant to remove the covers when I posted my pre-ballot. I have the ballot in a word doc and the covers were there for my notes - to remind me what the artists I wasn't as familiar with did. I'd also be quite interested to see the category if it was for the work of art, not the artist. That would be a fascinating discussion. Otherwise, thank you. I'd love to see more people weigh in and get various perspectives. I say we go ahead and have that interesting conversation after the Hugo Awards anyway. I'm sure we'll all have opinions about the winner vs. the also-rans. Nebula Award Nominee: "Non-Zero Probabilities"